Plans are in the works for a major Poetry of Presence reading at the Southern California Poetry Festival. The Festival will be held October 28-29 at Mt. San Antonio College in Walnut, CA. The reading will feature a number of POP authors and be the culminating event of the Festival. More details to come as we learn them. Our thanks to the Festival organizers, Donna Hilbert and Sonia Greenfield, for their generous support of mindfulness poetry. Mindful Music for Mindfulness Poetry! What would the world be without serendipity? If you’ve watched the official Poetry of Presence book trailer, you’ll remember the gentle guitar soundtrack. We chanced upon “Goodnight Esme (Instrumental Version),” composed and performed by Axletree, while searching the Internet for Creative Commons music to use in our video. As soon as we heard the piece, from the album Cormorant (pictured below), we knew it was just what we needed. Thank you so much for suggesting I write a little about mindfulness. It is a topic that means a lot to me. I am a lay monk in the Christian tradition and mindfullness plays a very important part in my life. So here goes…. I was touched that [you] chose this piece of music to promote Poetry of Presence, although perhaps I can’t say it is my music. As a poet myself, and as a philosopher and a monastic, I have learned gradually to understand the message from artists throughout history, who have said that their art is not theirs. When we create, something organic emerges. Our thoughts & feelings take form and become something new, with a life of its own. In mindfullness we learn to recognise the truth that, much as we might like to, we cannot take the credit or the shame for our ideas. Art grows out of mindfullness like a plant grows out of the soil, and just as we can tend a plant, care for it, and hope it comes to fruition, so we hope that our art manifests a deeper meaning. But also like the plant, we know that this meaning comes not from ourselves, but from life—from the heart of what is is to be alive. In bringing together this anthology, I sincerely hope that more people young and old will come to recognise and cherish the gift that mindfullness offers us, as a path to this heart, and as a return to our own lives, and to the overwhelming presence and delicate beauty of life itself. That whispers for the wintr’ing seeds to grow. There’s such sweet serendipity in all this! Thank you, Alex, for the gift of your music, your poetry, your soul. May you continue to touch this world with gentleness. All blessings on you and Axletree! to more of Alex’s music and poetry on the Free Music Archive. Many of you have been asking exactly when the book will be out and how you might purchase it. As soon as we know, we’ll be yodeling the date from the mountaintops, dropping leaflets from hot-air balloons, and skywriting with poetry drones. … which is to say, my co-editor Ruby Wilson likes to mull things over. Long and hard. Especially while walking. Which makes for enjoyable editorial meetings. But lately, due to a bum knee, Ruby’s been pretty gimpy. The pain and instability have made walking difficult, cramping her mulling style considerably. So today she’s having arthroscopic surgery. Partner, here’s hoping that your knee is soon as good as new. Until then, take a break from all mulling, except to ponder what your hubby might do to spoil you next! 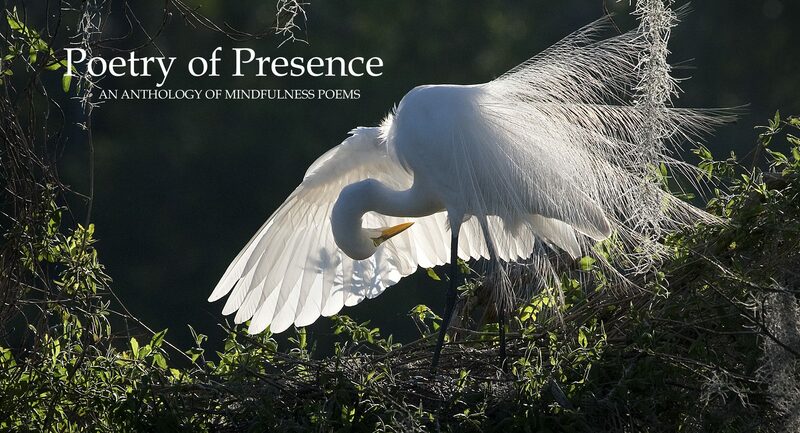 We want to give a huge shout-out to the photographer David Moyhnahan for “Great Egret Bow,” the amazing cover image on Poetry of Presence. 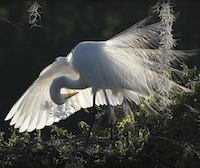 Be sure to browse more of his nature photography at his website. His shots will have you oohing and ahing. Kudos as well to Ginny Connors and her design team at Grayson Books for their work on the cover. It expresses so well the spirit of the book! We can’t wait to see the inside! We were saddened to learn about the recent passing of Chana Bloch, the wonderful poet and gifted translator. (Read her New York Times obituary here.) Chana’s poem “The Joins” is anthologized in Poetry of Presence, due out in late summer. When communicating with Chana over the past year, we realized her health was deteriorating rapidly as she battled sarcoma. We could only hope she would survive to see our book’s publication and, more especially, to finish the writing project to which she was still devoting her better hours. She was an incredibly generous and gracious correspondent, despite her suffering. We will remember you, Chana, through your beautiful words and obvious love for your craft. Thank you. Our deepest sympathies to your loved ones as they celebrate your life and carry your memory with them into whatever’s next. Whew! We’re hard at work, preparing this website for you. Stay tuned for its official launch! Coffee break’s over….